Having the right tool for the job is important but it only serves you if you can find that tool. An excellent way to organize your garage is by using pegboard. Pegboard is relatively inexpensive and easy to install. Hanging tools and such on pegboard will make them easy to locate, will help you avoid damaging tools by piling them in drawers and will keep your garage tidy. Pegboard helps keep your tools organized. Determine the size of the pegboard required. Pegboard can be purchased in 4-foot by 8-foot sheets. You may want the whole wall to be faced with pegborad or may want to cut it down with a table or circular saw to the size desired. 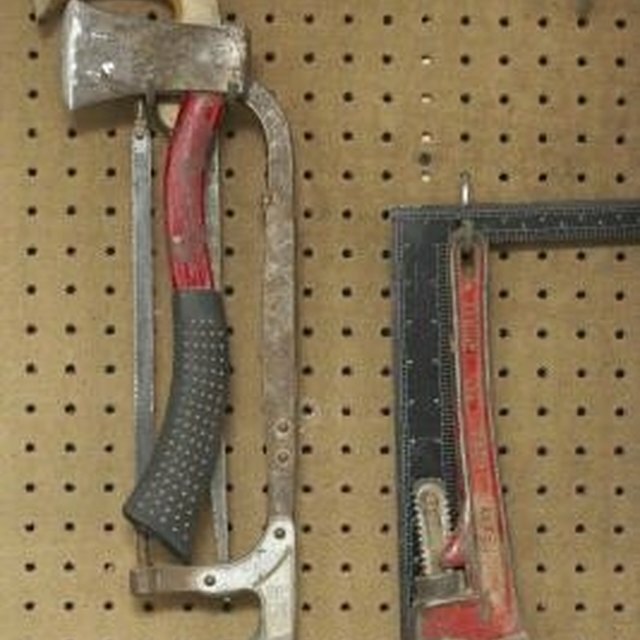 Cut 2X4s to serve as the frame for your pegboard. You will need one piece for each side, cut to the same height as the pegboard. Screw the 2X4s to the garage wall so that the on center distance between them is the same as the width of the pegboard. Use a level to ensure that the 2X4s are straight up and down. Place the pegboard on the 2X4s. Use the level to make sure it is evenly placed and screw the board to the two by fours. The 2X4s will allow for space between the garage wall and the back of the pegboard to utilize pegboard hooks. Cut one 2X4 to length and mount as above for each additional piece of pegboard. You can utilize the exposed half of the 2X4 from the previous piece of pegboard as one side of the frame. If your garage does not have a finished interior wall, you can utilize the exposed studs as the framing and mount the pegboard directly to them. There are many varieties of pegboard hooks that can be used to hang various items such as hammers, electrical cords and large garden tools. Most garages have a wall height sufficient for an 8-foot tall piece of pegboard, however you will want to keep in mind that the lower few feet of wall space may be best left for items that may be placed on the floor, such as lawn mowers or bicycles. Do not span more than four feet wide with the frame. The pegboard will bow and buckle from the weight without additional support.